PTZ security cameras are some of the most effective cameras when speaking of video surveillance systems. 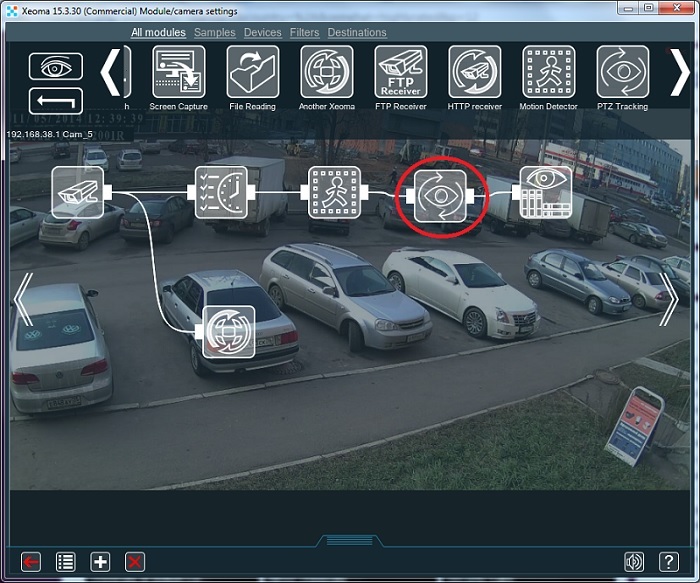 If your camera supports PTZ then you can enjoy ‘PTZ Tracking’ in Xeoma. Xeoma now can track moving objects using PTZ tracking automatically. With ‘PTZ Tracking’, your video surveillance systems with Xeoma automatically detects and follows moving objects, which helps you to effectively discover and handle incidents. For your convenience in operation you can set up maximum vertical/horizontal steps, the time of following the object for before going back to the start position, zoom speed and more. In advanced video surveillance systems like Xeoma automatic PTZ tracking can be combined with manual PTZ control. This might be a complex issue, connected to both settings of Motion Detector and PTZ tracking. First of all, please take a look at the “Follow the object for (seconds) before going back to the start position” setting of the PTZ Tracking module. The value in “Follow the object…” is how long the object will be tracked for. By default it’s set to “Always” which is OK in most environments where false detection is not happening – the object is followed for as long as it’s moving, no time limitation. So it might be a good idea to set it to a smaller value and see if the camera “goes back” after 5 seconds of tracking an object (or even a “false” object). Secondly, the “Wait before going back to start position after motion ended (seconds)” setting might influence going to the start position. This setting doesn’t allow the camera to go to the start position for N seconds after motion ended. So in your case, when a lot of false alarms are happening, the camera simply doesn’t get more than 5 seconds idle that will allow it to get back. Please try a lower settings like 1 here.